A 100 Great Geosites nomination from Pamela Ross. My favourite geosite (of very many along the North Yorkshire coast!) is Cayton Bay in North Yorkshire. Since is cut by two faults, both ends of the Bay are quite different. From the top of Red Cliff, there is a sheer drop. 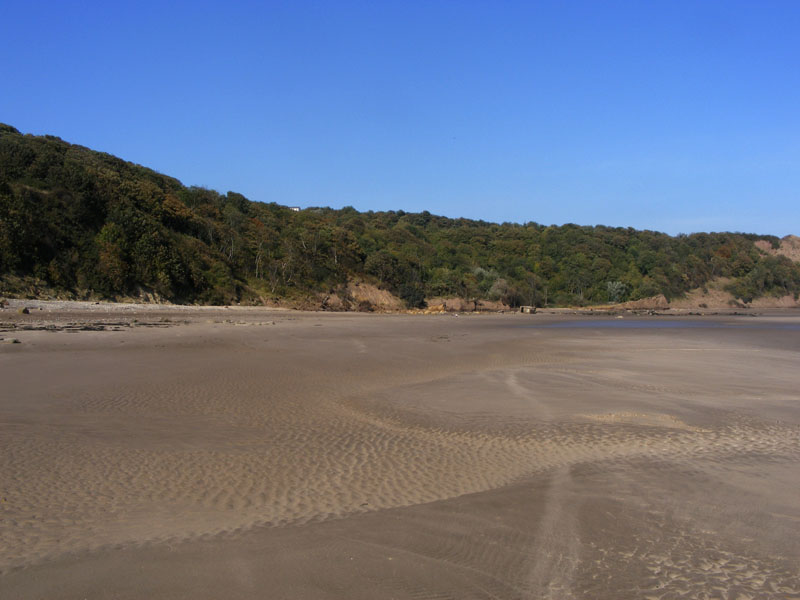 At the north end of the Bay, the woods sweep down to the beach, giving it almost a “tropical” feel, and as you clamber round the end of Osgodby Point and over the Cayton Bay fault, there are blocks from the millepore beds to admire. Beyond Cayton Bay to the north is Cornelian Bay, also cut through by the fault. Both that Bay and Cayton Bay have pill boxes on the beach – handy for seeing how much sand build up there is. 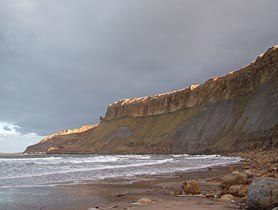 The south end of Cayton Bay, with the Red Cliff fault. At the south end of the Bay, the majestic sweep of the cliff is broken by the Red Cliff fault – the Cornbrash is sometimes exposed on the beach, and the Osgodby Formation, at beach level, looks like stone columns from an ancient temple. Sometimes it’s difficult to reach them – at others, the boulder field in front has been totally covered by sand. Recently, there has been some erosion at the top of Osgodby Point – former holiday homes disappearing over the edge of the cliff. The creep of the boulder clay underlying the woods has caused slumps on the beach from time to time. Beyond the southern end of Cayton Bay is Gristhorpe Bay – also a fascinating place, but more difficult to access – featuring Jurassic plant fossils. 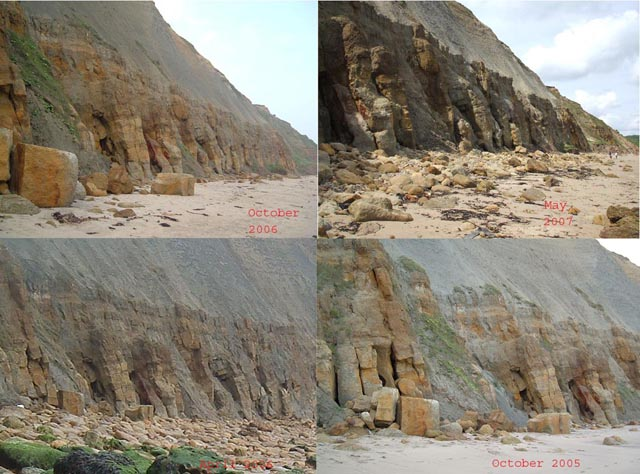 Tide out and in – exposing Scarborough Formation rocks. Scarborough is in the distance – the Cayton Bay Fault cuts through behind the castle. On the right, you can just see the waterworks – the fault “starts” from behind there. If you would like to write a blog about your favourite geosite, as part of the 100 Great Geosites project, write to us at 100geosites@geolsoc.org.uk. Visit our Flickr page to see the nominations so far! Tags: 100geosites, Cayton Bay, fault, fossils, geology. Bookmark the permalink.